For sixteen years two Queensland cane cutters have worked the punishing routine up North in the sugar cane fields for seven months of the year and travelled back to Melbourne to meet up for five months of partying and romance with their barmaid girlfriends. This seventeenth summer everything is different. One of the barmaids has ‘settled down’ and married a city bloke so a replacement date has had to be found. This ‘off-season’ proves challenging for them all. Plays and playwrights go in and out of fashion but some endure and speak to each subsequent generation. Summer of the Seventeenth Doll by Ray Lawler was a triumph at its premiere on the night of November 28, 1955, at the Union Theatre in Melbourne. The production toured the nation over the next few years and then travelled to London where it won an award for best new play after a hugely successful West End season in 1957. It crashed and burned on Broadway in 1958 when audiences found the Australian accents and humour difficult. It has been produced countless times in Australia ever since but it has been a while since Canberra and the region have seen it. Lawler’s tale of Queensland cane cutters and Melbourne barmaids has endured, but not due to nostalgia, nor because it spawned a new age in Australian writing for the theatre. The Doll has endured because the characters and their dilemmas are so true, so beautifully observed, so humorous and so poignant. Jordan is a founding member and Artistic Director of the award winning Centrepiece Theatre, and founding member of the new PigeonHole Theatre. She studied cello at The Canberra School of music, and acting at The Victorian College of the Arts and was most recently seen onstage as Dr Emma Brookner in The Normal Heart (Everyman Theatre) and as the cellist in PigeonHole Theatre’s Playhouse Creatures, which she also directed. Other acting credits include; The Crucible, Amadeus, A Streetcar Named Desire (Free Rain), Home at the End, Company, (Everyman), Don’t Dress For Dinner, Can’t Pay? Won’t Pay!, The Imaginary Invalid, Goldilocks and the Three Bears (Centrepiece Theatre). Andrea returns to the local stage after a few years’ break and it was the strength of not only this play but the incomparable cast and crew which lured her back. She is the recipient of several awards for her performances over the past 15 years, including the ACT MEAA Green Room Award for Professional Performer of the Year, Best Actress CAT for Martha in Who’s Afraid of Virginia Woolf and Best Supporting Actress CATs for Barbara in August: Osage County and Theresa in The Memory of Water. Andrea trained at Actors Centre Australia and hopes you embrace The Doll as we travel down memory lane to a time that illustrates how little things have changed. Craig Alexander is an actor, writer and producer with a Bachelor of Arts (Honours) in Acting. He has an extensive history touring throughout regional centres with Riverina based Gearstick Theatre; the company which he co-founded and led as Artistic Director for almost ten years. Stage credits include Cold Light (Street Theatre), his acclaimed solo production of Jacob Marley’s Christmas Carol, Sexual Perversity in Chicago (Gearstick) and Dead To The World (RTC). Screen credits include The Code 2 (Playmaker), Dirt (Next In Line Films) and Insecure Digital (ScreenCraft). He’s currently developing the multiplatform comedy series Trainee Bomb Squad and adapting several classic horror tales for the stage. Dene Kermond is a graduate of Theatre Nepean, Western Sydney University. He has worked consistently at the Street Theatre since arriving in Canberra with Widowbird and Heart Of A Dog the musical among other plays, performed readings and development workshops for The Hive program. For Wild Voices Music Theatre Dene appeared as Captain Cat/Mr Pugh/No Good Boyo/Mr Waldo in Under Milk Wood (The Street Theatre) and the Bard in Wild Shakespeare (Enlighten Festival 2016/The National Zoo). Australian theatre credits include some of his favourite roles: Malvolio in Twelfth night, Paris in Romeo & Juliet, lead roles in Deviant Art, Sleeping Dogs Lie, and The Ice Season with Impulse Company London/Griffin Theatre Company Sydney, PAN for MEAG and Jim Henson’s Workshop at The Capitol Theatre, and All My Sons directed by Gale Edwards with the Sydney Theatre Company. Television credits include regular guest roles in Home & Away and Police Rescue and critical successes in G.P. and A Country Practice. He has performed and co-created numerous award-winning advertising campaigns such as ANZ ‘Security’, Yellow Pages, Toyota Kluger, Sony, Fairfax and Googong (A.C.T). Award-winning films include Two Ships, Strictly Ballroom, The Comedian, Dirty Deeds, and as Malcolm Heslop in Muriel’s Wedding. The youngest child of Pamela and Warren Kermond, Dene is a fourth generation performer from a vaudeville, variety and music theatre legacy, who also brings extensive experience in a physical approach to acting. Trained in a range of acting techniques, Dene also learnt several performance skills from his family including acrobatics and tumbling, tap and jazz, singing, juggling and slapstick – all making him well equipped for a range of styles and practices. As a child performer he achieved critical acclaim with screen and stage credits such as Gavroche in Les Miserable (1987-89/Victor Hugo award), Louis in The King & I with Hayley Mills (1991/Critics Choice award), Bobby in the Sci-Fi film The Distant Home, Peter in A Country Practice, and Sean Ricketson in G.P (Critics Choice award). He is very proud to have worked alongside his eldest son in the A.C.T. regional Googong media campaign. In 2013 he received with his family the Life Education’s 2013 ‘Gold Harold Award’ for services to youth through the performing arts. Since 2014 Dene has worked closely with Aspen Island Theatre Company and Julian Hobba toward mainstage productions as the title character in Four Day Oedipus, as Matthew in The Slip Lane, and alongside Max Cullen in the 2014 critically celebrated play Bartleby. They are currently working on a new project involving the Mr Fluffy experience. Dene devised and performed the role of Barney in a physical theatre adaptation in 2007, and has been eager to perform with the full script ever since. Further, he is excited to work with this respected cast in Pigeonhole Theatre Company’s second production, Summer Of The Seventeenth Doll. Zoe started performing onstage in 2010 and since then has featured in several musicals including Footloose with Supa Productions in 2013, for which she, along with Kirrah Amosa and Claudia Tetrault-Percy, was nominated for the CAT award for best ensemble in a musical. Her most recent musical was Legally Blonde the Musical with Free Rain Productions in 2014. 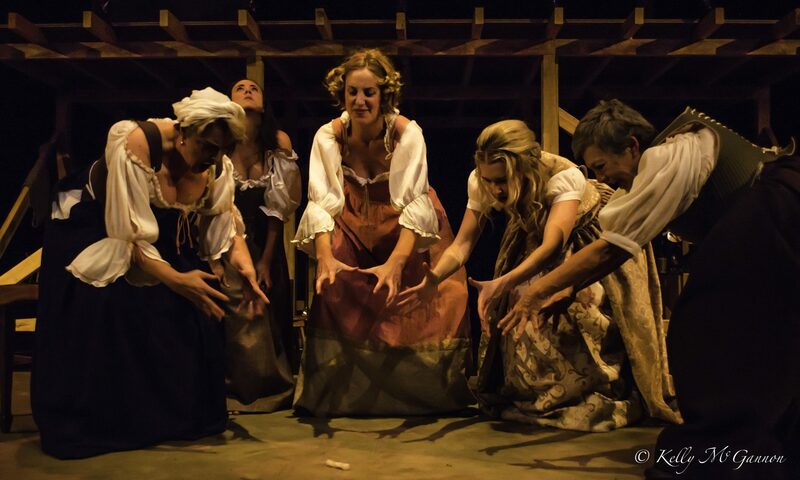 Zoe then starred in her first amateur play, Canberra Repertory Society’s production of The Crucible. She played Abigail Williams, a role for which she was awarded Canberra Repertory’s Ted Light Award for best dramatic performance of the year and was nominated for a CAT award for best actress in a featured role in a play. Zoe is thrilled to be working again with Jordan Best and grateful to have the opportunity to meet and work with the incredible women working on this wonderful piece of theatre. Liz began her theatrical career at Canberra Rep 40 years ago with Ross Macgregor. She has directed and performed for Canberra Rep, Papermoon, Centrepiece Theatre, Everyman Theatre, The Players Company, The Q and Free Rain. She has won the Critics Circle Award for directing Angels in America; Two CAT Awards (best director and best play) for Entertaining Mr Sloane for the Players Co; Best Actress twice at the Wagga Festival that was. Liz has worked extensively with the late Ralph Wilson where she received an education in abstract and classic works. She was part of The ANU Drama Department assessment of final year student productions. She directed the sold out season of To Kill a Mockingbird for Free Rain Theatre Co, and delighted audiences in A Midsummer Night’s Dream directed by Jordan Best at The Q. She wowed them as Clairee in Steel Magnolias directed by Jordan Best at Rep, and has enjoyed critical acclaim in August Osage County directed by Cate Clelland for Free Rain. She also worked with Richard Roxborough on a production of Cloud Nine done professionally at the ANU, and was in the first professional production at the then new Street Theatre. In 2015 she was in The Crucible directed by Jordan Best, and Casanova directed by Jarrad West both at Canberra Rep. That year she also directed a successful production of Tuesdays with Morrie at The Q, for which she won The Critics’ Circle Award for Directing. Tuesdays with Morrie won the Best Play at the 2015 Canberra Area Theatre (CAT) Awards. Karen Vickery graduated from NIDA in Acting in 1983. Since then, she has performed in all media and for many companies including Sydney Theatre Company, Belvoir, commercial theatre, ABC TV and Radio dramas, and commercial television. Karen was Lecturer in History of Theatre, Film and Applied Arts at NIDA from 1996. She worked in this capacity until the end of 2011, after becoming Head of Performance Practices in 2006. Karen has translated Russian plays for NIDA, WAAPA, Belvoir, Sydney Theatre Company and Sport for Jove and worked as a dramaturg specialising in Chekhov and Gorky. Since arriving in Canberra, Karen has played M’Lynn in Canberra Rep’s production of Steel Magnolias, and Violet Weston in Free Rain’s August: Osage County. Subsequently, Karen played Lady Bracknell in The Importance of Being Earnest for Rep, and Joanne in Sondheim’s Company with Everyman Theatre at the Q.
Karen has also tutored in acting at Canberra Youth Theatre and directed CYT Senior Ensemble in David Ives’ All in the Timing as part of Studio Underground. She is on the Board of CYT. She also directed The Normal Heart for Everyman Theatre last year. Karen is enormously proud to be a founder of Pigeonhole Theatre with Jordan Best and Liz Bradley and played Mrs Betterton in their inaugural multi-award winning production of Playhouse Creatures which tours to Monaco later this year. Karen is the Director of Learning and Visitor Experience at the wonderful National Portrait Gallery.